Greek Detention Centre, back in 2011. On March 30th a new pre-removal detention center was opened on Kos Island. Similar detention centers are planned on other islands of the Aegean. After the implementation of the EU-Turkey Deal on 20 March 2016, refugees arriving newly to Greece are caught on the islands. News from Refugee Support Aegean (RSA), implementing partner of PRO ASYL. The first 55 refu­gees were alrea­dy trans­fer­red to the new cen­ter on Kos Island. Up to 150 refu­gees and migrants will be locked up in this clo­sed camp situa­ted next door to the over­crow­ded hot­spot of Kos, whe­re alrea­dy more than 810 refu­gees are stuck. „Detenti­on cen­ters – we’re finis­hed with them“, for­mer Depu­ty Inte­rior Minis­ter Gian­nis Panou­sis said back in Febru­a­ry 2015, when the new­ly elec­ted government was still plan­ning to impro­ve the con­di­ti­ons for refu­gees in Greece. In a U-turn, exten­si­ve detenti­on and depor­ta­ti­on now see­min­gly beco­mes a workab­le solu­ti­on for the government. The SYRIZA led government with the sup­port of the EU opens new detenti­on faci­li­ties dedi­ca­ted to depor­ta­ti­ons on the Greek islands. „Wit­hout clo­sed camps second instan­ce decisi­ons can­not be imple­men­ted”, was the cyni­cal state­ment of Migra­ti­on Minis­ter Gian­nis Mouz­a­las only some hours after a refu­gee in the Hot­spot Vial on the island of Chi­os set him­s­elf on fire. Last week refu­gees in Les­bos Island pro­tested against the fea­red start of mass depor­ta­ti­ons. More than 2,194 refu­gees and migrants are alrea­dy detai­ned in the six detenti­on and pre-remo­val cen­ters cur­r­ent­ly exis­ting in main­land Greece (Amyg­da­le­za, Corinth, Paranesti/Drana, Xan­thi, Fylakio /Orestiada, Petrou Ral­li Ali­ens Direc­to­ra­te) some­ti­mes for more than six mon­ths and under inhu­man and degra­ding detenti­on con­di­ti­ons. About 10,000 are being held on the Aege­an islands wit­hout any pos­si­bi­li­ty to move on to the main­land. In public dis­cour­se rep­re­sen­ta­ti­ves of the Minis­try of Migra­ti­on descri­be the future detai­nees to be main­ly “cri­mi­nals” or “trou­ble­ma­kers” try­ing to jus­ti­fy the fur­ther expan­si­on of detenti­on mea­su­res with secu­ri­ty con­cerns. In fact, in the new detenti­on faci­li­ties on the Aege­an Islands the­re will be main­ly tho­se detai­ned, who­se asyl­um claims were decla­red inad­mis­si­ble, or which are rejec­ted in first and second instan­ce in order to faci­li­ta­te and secu­re the plan­ned fast depor­ta­ti­ons to Tur­key. The legal frame­work defi­ning the grounds for detenti­on of refu­gees and migrant, lea­ves many opti­ons for arbi­tra­ry detenti­on, i.e. under the gene­ral grounds that per­sons who are alle­ged of “law-brea­king con­duct” or “con­si­de­red to app­ly merely in order to delay or frus­tra­te return“ can be detai­ned. 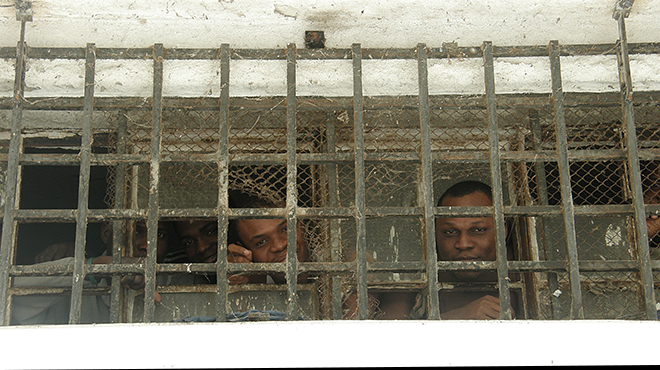 The­se pre­re­qui­si­tes open up the pos­si­bi­li­ty to arbi­tra­ri­ly detain almost every pro­tec­tion see­ker on the islands. Some of the­se admi­nis­tra­tively detai­ned pro­tec­tion see­kers who are to be trans­fer­red to the new pre-remo­val cen­tres in the near future have alrea­dy been impri­son­ed for weeks or even mon­ths in the hot­spots or the con­ge­sted poli­ce sta­ti­ons on the island under inhu­ma­ne con­di­ti­ons, most of them wit­hout any court decisi­on. At the same time, throughout 2016, more than 1,600 pro­tec­tion see­kers were trans­fer­red from the islands to pre-remo­val detenti­on cen­ters on the main­land. After Kos, also on Samos Island a new detenti­on and depor­ta­ti­on cent­re will open soon. Local soli­da­ri­ty groups alrea­dy report of poli­ce raids and many arrests. In the mean­ti­me, on Chi­os Island a pilot pro­ject is run­ning in order to fas­ten up regis­tra­ti­on, asyl­um pro­ce­du­res and detenti­on. Detenti­on con­di­ti­ons in Greece have been denoun­ced by inter­na­tio­nal NGOs and the European Com­mit­tee for the Pre­ven­ti­on of Tor­tu­re (CPT) as inhu­ma­ne and ina­de­qua­te. Greece has been con­dem­ned dozens of times in the past by the European Court for Human Rights for the inhu­man and degra­ding con­di­ti­ons in detenti­on cen­ters.